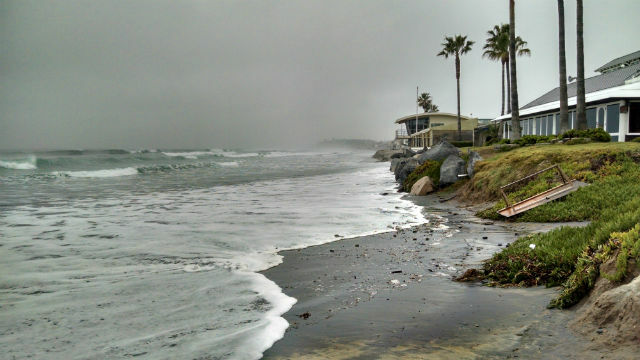 The Del Mar City Council on Monday is poised to reconsider a “planned retreat” along the beach, where homes and other improvements may have to be removed before global ocean level rise claims them. Planned retreat is a strategy of removing structures and roads from the path of the rising sea. Some residents have said that acknowledging that homes and businesses near sea level may have to be systematically moved or destroyed will hurt property values. But the California Coastal Commission requires all seaside cities to have a plan for rising sea levels that includes planned retreat as a possibility, according to the San Diego Union-Tribune. Should the city fail to comply, the Coastal Commission could decline to certify Del Mar’s Coastal Development Plan and take over the authority of approving building permits along Del mar’s prized oceanfront. The Union-Tribune reports that city officials and residents say planned retreat won’t work for the exclusive beach town, which has about 600 homes on ground low enough to be affected by a possible seven-foot rise in sea level by 2100. The City Council last discussed the issue at its April 16 meeting, but postponed the final decision until this week. Retreat will only be considered as a last resort, according to the most recent version of the city’s strategy. But just the presence of the word “retreat” is enough to cause concern, and will make it difficult to secure loans or sell properties, some residents said. Resident Herb Montgomery told the Union-Tribune that the city needs to find a different way to battle the rising ocean. But others said the city needs to acknowledge planned retreat as a possibility now. “Global warming is real, and sea-level rise is a fact,” resident Ann Feeney, chair of the city’s Sustainability Advisory Board and a professor at The Scripps Research Institute, wrote in a letter to the city council.